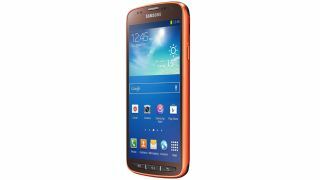 The rugged Samsung GALAXY S4 Active is the ideal all-action, peak-performance smartphone for ramblers, mountain bikers, sailors and fans of extreme sports. Not only that, this durable, dust-proof and water resistant phone is the ideal smartphone for the terminally clumsy! Toddler dropped your phone in the toilet? Hey, no problem! The GALAXY S4 Active can be submerged in up to a metre of water for a full thirty minutes. The first stress test does double duty as an amazing practical joke. The execution is simple: you need a pub, a couple of not-too-tech-savvy mates, and a pint. Making sure that the charging port on the GALAXY S4 Active is sealed (as you'll look a right fool if it's not), casually drop your phone into your ice-cold beverage of choice. Your mates, if all goes well, will freak out that you've just ruined your shiny new smartphone, which will make them look a bit thick when you casually continue sipping. Added points for downing the drink, then licking leftover froth off your phone! Sadly, the world isn't just filled with beautiful, amber-clear liquids; there's mud and grit out there too. The GALAXY S4 Active's IP67 rating equips it to handle this big, nasty world; but you don't need to just take our word for it. One thing to look forward to from our lovely British winter is the fact that you'll find the S4 Active stands up rather well to muddy puddles – you know, the sort that mountain bikers love to splash passers-by with. But now there's nothing you need to worry about (other than getting your trousers dirty). The S4 Active isn't just equipped to handle wet and dirty conditions though; it's also capable of performing perfectly well in extremely hot and cold environments. To test the former, why not try out a quick sauna. Even in the baking heat of a hot wooden shed, the S4 Active will outlast any mere mortal. Though watch out for those disapproving glances from the other members of your gym! Treat yourself to a cold Pimms in our chill-test! Nothing does stress testing like going from the extremes of hot to the extremes of cold (fun fact: this is how the military stress-test the electronics that get bolted onto fighter jets). Chill-testing the S4 Active is both easy and rather pleasant (in warmer weather, at least): a couple of bags of ice, a bucket and the handset in question are all that's needed to prove that the S4 Active would handle the ski slopes with aplomb. Most smartphones are 50% silicone; so are the sand grains adorning Spain's lily-white beaches, but that doesn't mean that they'll play nicely together. To prove that the GALAXY S4 Active is a few smarts above other smartphones, a simple test is in order: a variation on the classic seven-year-old's sandcastle, but with the S4 Active acting as a neat supporting buttress in the very centre. Just remember to rescue it before the tide washes the whole thing away! Once it's free of the sand, the GALAXY S4 Active will go straight back to normal (which is more than you'll be able to say for your beach towel). Give your mud-spattered S4 Active a quick power wash! Power-washing your patio is once of those horribly boring chores that can be made infinitely better by the misuse of expensive power tools. Case in point: proving the GALAXY S4 Active's water resistance by giving it a thorough cleaning, but with a high-pressure power hose rather than a gentle microfibre cloth. (Again, remembering to close that charging port is probably a good idea).